Anthopleura dalyae sp. nov, a new species of sea anemone (Actiniaria: Actiniidae) from the rocky intertidal zone of La Gallega reef, Veracruz, Mexico, is described and illustrated. This species is characterized by a column that is pale yellow proximally and dark-orange to bright-orange distally, longitudinal rows of verrucae from margin to limbus, and a series of marginal projections with acrorhagi. Anthopleura dalyae sp. 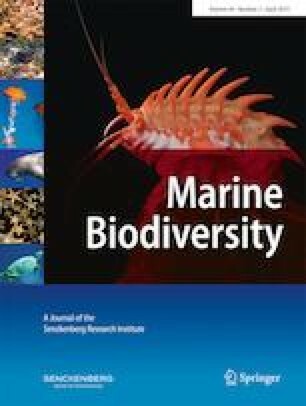 nov. is distinguished from other species of Anthopleura from the Gulf of Mexico by several taxonomic characters, such as column coloration, number of tentacles, variable number of directive mesenteries and siphonoglyphs, as well as some differences on cnidae. Anthopleura dalyae sp. nov. is the fourth species of the genus occurring in shallow intertidal waters associated to coastal and coral reef environments of the region, and the third species of the genus Anthopleura recorded in the southern Gulf of Mexico. This article is registered in ZooBank under urn:lsid:zoobank.org:pub:407AE066-7321-47D0-8EA3-E1525207B0EB. The first author is grateful to the Programa de Becas Postdoctorales Latinoamericanas of the Consejo Nacional de Investigaciones Científicas y Técnicas (CONICET). This study was partially funded by the Universidad Nacional de Mar del Plata (project EXA747/16 to F.H.A.). We thank the Comisión Nacional de Áreas Naturales Protegidas (CONANP) and the staff at the Parque Nacional Sistema Arrecifal Veracruzano for their helpful assistance during field work. All specimens were collected under the consent of Mexican law, collecting permit approved by Comisión Nacional de Acuacultura y Pesca (number 07332.250810.4060). José Luis Tello-Musi and Nuno Simões from the Universidad Nacional Autónoma de México (UNAM) provided support for field work; Maribel Badillo-Alemán (UNAM) provided access and support to histological facilities; Gemma Martínez-Moreno (UNAM) and Patricia Guadarrama-Chávez (UNAM) helped with lab work and provided support in the microscopy lab. We thank the commentaries of the two anonymous reviewers which helped us to improve this manuscript. This study was partially funded by the Universidad Nacional de Mar del Plata (project EXA747/16 to F.H.A.). All applicable international, national, and/or institutional guidelines for the care and use of animals were followed by the authors.